When a male Asian Citrus Psyllid is looking for a mate, he situates himself on a twig, buzzes his wings to send vibrations along adjacent leaves and branches, and listens for a female's response call. If the call comes, he travels in her direction, the abbreviated insect version of courtship ensues, and two to seven weeks later, scores of psyllids nymphs emerge from their eggs, feed on phloem sap, and mature into adults who head out into the world, ravaging untold numbers of citrus trees in the process. The pest is loathed by orange farmers, not because of the direct damage the insects cause, but because they spread an even more pernicious foe: a rod-shaped bacteria called Candidatus Liberibacter asiaticus. The bacteria cause a disease called citrus greening that turns the trees' leaves a sickly yellow and makes the fruit bitter and stunted. There is no cure, and the infected trees usually die within a few years. To halt the spread of the disease—which was responsible for an estimated $3.63 billion in lost revenue from orange juice for the state of Florida from 2006-2012—researchers at the U.S. Department of Agriculture (USDA) and University of Florida (UF) are developing vibration traps that hijack psyllid mating calls to locally bring their populations under control. "The route I'm trying to take is looking at disrupting mating and putting out signals that either outcompete the females and bring males to a trapping system, or just make it difficult for males and females to communicate with each other," said Richard Mankin, a research entomologist at the USDA's Center for Medical, Agricultural and Veterinary Entomology in Gainesville, Fla. A collaborator on this project, Barukh Rohde, is a Ph.D. student in the UF Department of Electrical and Computer Engineering. The researchers will discuss the construction and operation of their device, which contains a piezoelectric buzzer and a microphone wired to a microcontroller, at the 170th meeting of the Acoustical Society of America (ASA), held Nov. 2-6 in Jacksonville, Fla.
Mankin's previous work at the USDA involved using acoustic methods to find hidden infestations of insects, such as rice weevils inside grain kernels. This brought him to an interest in hemipteran insects, so called "true bugs," he said, due to their use of acoustic communication and their recent resurgence as pests due to the gradual phasing out of pesticide use after the introduction of Bt corn, a popular genetically modified maize variant that is toxic to most lepidopteran (moth) pests. "The moth pests aren't around anymore, but the hemipteran insects that used to be controlled also by the pesticides are still present, so we're looking at other options for controlling hemipteran like psyllids that use vibrations in their communication mating system," he said. Although pesticides had been phased out in citrus growing years prior, due to health concerns, Mankin said, "all that changed when we had to really dig down and do multiple sprayings each year to keep down the psyllids populations so that we could get an orange crop—and we're trying to still develop new ways to solve the problems—because we're anticipating in a few years that the psyllids will become resistant to the current pesticides." Out in the mid-day heat of the orange groves—the psyllids are most active between 10:00 a.m. and 3:00 p.m.—the male psyllids channel their wing vibrations down their legs and out through adjacent twigs and leaves. If a nearby female is interested, she'll reply back within a third to a half of a second. Within this window, the researchers' microphone detects the incoming male call and the microcontroller sends out a female response call through the piezoelectric buzzer before any neighboring psyllids can. When the male draws closer, he gets snagged and immobilized on an adhesive surface, from where he can be collected during periodic trap inspections. 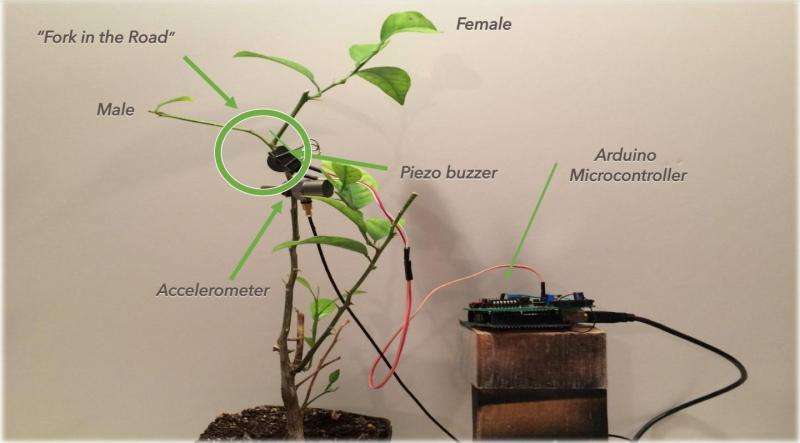 While the device hasn't yet been tested extensively out in the field, Mankin estimates that each device would be effective over a range of two feet in a citrus tree, with a cost of construction between $50-100, including the cost of the microcontrollers, which are bought from a company called Arduino that uses open source code. Ongoing work for Mankin and his colleagues involves incorporating better "speech" identification algorithms into the software and reducing the system's response time, as well as finding ways to cut the cost of the final device. In addition, studies are in progress to optimize signals that disrupt communication across the trees. "If you can target low populations and treat just the isolated populations, the costs are quite a bit lower, and there's less environmental damage," he said.